As I watched Hugo, the first 3-D/children's film from Martin Scorsese, I could not help think that Hugo is a love letter from one genius to another, in this case from Scorsese to French film pioneer Georges Méliès. All of Scorsese's great passions are there: film itself, the wonder and magic of cinema and the importance of preserving cinema history. 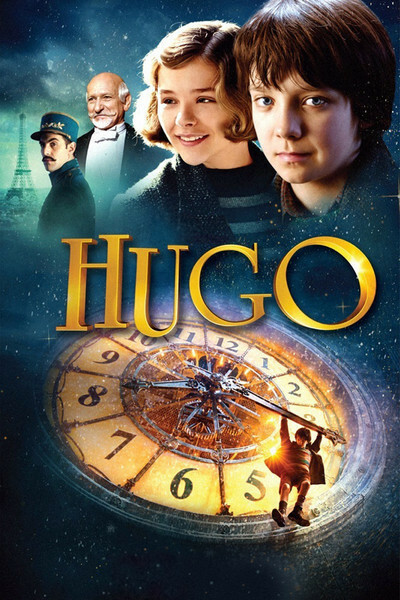 Anchored with some truly brilliant production work and some wonderful acting, Hugo is an absolute delight from beginning to end, and despite one or two missteps the film is simply a joy. Hugo Cabret (Asa Butterfield) lives within a giant Parisian train station, keeping the clocks running. He's an orphan, after his father (Jude Law) dies in a museum fire. Before his death Hugo's clock-maker/repairer father brings a discarded automaton to repair, a precursor to the animatronic figures used on Disneyland/Disney World rides. After his father's death, Hugo continues the work, albeit with an important part missing: the heart-shaped key. As it goes, Hugo spends his life in the station, avoiding the Station Inspector (Sasha Baron Cohen) and admiring the toy stand of a lonely shopkeeper. One day, the shopkeeper catches his, seizes Hugo's notebook, and says he will burn it. This notebook is highly valuable to Hugo, and he follows the shopkeeper to his home, and there see a young girl. This girl, Isabelle (Chole Grace Moretz) agrees to save Hugo's notebook. We eventually learn a few things: that Isabelle loves books of all kinds, provided by the kindly bookshop owner Monsieur Labisse (Sir Christopher Lee), and that the toy shopkeeper is her godfather, whom she calls Papa Georges (Sir Ben Kingsley). Soon, a friendship relationship begins between Isabelle and Hugo. Hugo takes Isabelle to her first movie: a premiere screening of Harold Llyod's Safety Last! and soon, we have discoveries. We discover that Isabelle has a heart-shaped key that fits into the automaton, and once functioning the automaton reveals an image from Hugo's memory of his father. We also discover the truth about Papa Georges: he's none other than famed French film director Georges Méliès. We learn that Méliès is now a forgotten figure, so forgotten that Melies fan/film historian Rene Tabard (Michael Stuhlbarg) believed him dead. At last, the story of Méliès and his connection to the automaton is revealed, as is how his once-joyful and glorious career as an inventive director came to a sad end, along with his movies, lost to history. As is the way of a good film, we do have a happy ending: Georges Méliès is brought back to the forefront of French cinema culture, recognized as the pioneer that he is; we learn that of his 500+ films, we do have over 200 that have survived. Hugo has a home with the Méliès, the denizens of the station have found happiness themselves, and the automaton is restored. Perhaps this is the message, the theme that Scorsese placed in his adaptation of Brian Selznick's juvenile novel The Invention of Hugo Cabret: how films/books are conduits to dreams, to fantasy, adventure, romance. Certainly, Hugo can be seen as an informal primer into the early days of cinema: we learn in a flashback how Méliès discovered films, and we get loving recreations of some of his films including his most famous work: A Trip To the Moon. Hugo is at its heart a celebration of imagination. 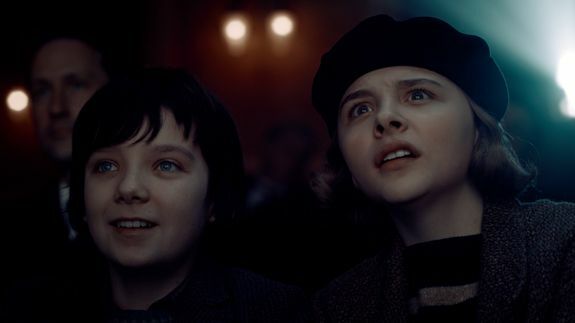 I say this because our two main juvenile characters see the joy that comes from either imagining things in their minds or being swept into the world of early cinema. Curiously or perhaps, deliberately, Scorsese echoes famous scenes from film in Hugo. Twice we see that Hugo is in danger of being run over by a train, echoing when the first film of a train coming to a station terrified unaware audiences. As Hugo races to escape the Station Inspector, he's forced to hide out in front of a clock while holding on for dear life. If you look real closely, you not only get 'cameos' from famed jazz musician Django Reinhart playing at the station, but we also get quick sightings of James Joyce and Salvador Dalí. Scorsese not only brings the Paris of the Roaring Twenties back to life with Robert Richardson's beautiful cinematography, Howard Shore's Belle Epoque-tinged score, and Dante Ferretti's brilliant art direction, but with the 3-D he does something I thought thoroughly impossible: he comes as close as anyone can or probably ever will in putting the audience within the film itself. One has to always remember that Scorsese is not only one of cinema's great defenders and most passionate fans, but one of its greatest and most meticulous craftsman. He would be the first to use 3-D not as a gimmick to give the audience a momentary thrill but to use it as part of the story. I can't recall a particular moment when the 3-D either interfered with my enjoyment of Hugo or where it was gratuitous. The opening sequence as we head into the train station itself is worth the 3-D, and in fact, along with Avatar, Hugo is the only film I can think of that has used 3-D to place you inside the film rather than have the opposite effect and keep you out of it. 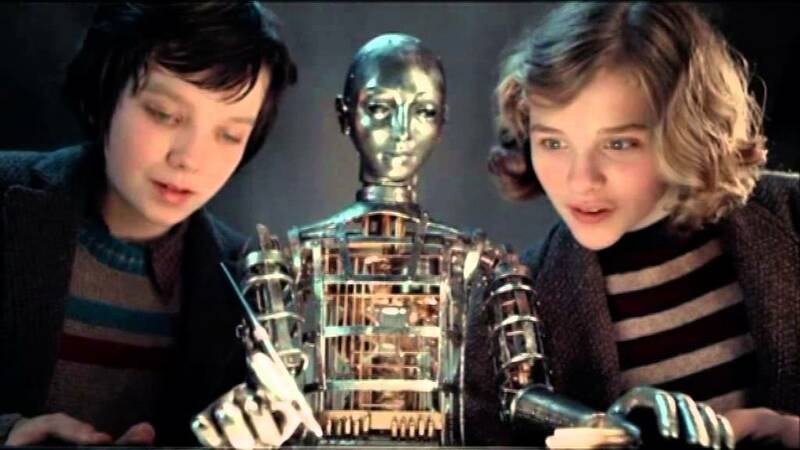 Hugo, in fact, is the only film that I can think of that might be better in 3-D than 2-D.
For me, curiously, the most magical moments in Hugo on the technical level relate to the most simple effect: the fall of snow upon a wintry Paris. If there was ever an element that put you inside the movie, that made you feel part of the story, it is this simple effect. I credit it to Scorsese's constant need to use all the technology to serve the story rather than to show off what can be done. Scorsese also brings that innocence and whimsy to how he gets his actors to perform. Kingsley balances the hyper passion of Méliès with the sadness to see his work forgotten and lost. Butterfield has a great expressiveness as the sad yet still hopeful Hugo. Moretz brings a joie de vivre and sense of adventure to Isabelle. In a small role, it is a surprise and delight to see Sir Christopher Lee as the kindly Monsieur Labisse. His voice, his presence, in his too-brief time on screen commanded attention, and showed that he was not there just for marquee value but that he did have a role to play. Even Law, on screen for about two minutes, brought a genuine warmth to his role as Hugo's loving father. As it is, the only thing that I didn't like was Cohen. Every time he was on screen, doing a combination of Inspectors Clouseau and Javert from Les Miserables, I was bored. I didn't care for his shtick. I didn't care about his romance. I just didn't care for him or his character. In fact, when I saw him with his dog, I kept flashing back to G. W. Bailey's role in Mannequin (itself a variation of his Lieutenant Harris from the Police Academy films). That whole subplot of the Station Inspector I think could have been trimmed or cut entirely without affecting the overall flow of Hugo, and it might have even made it better. The film already is a long one (128 minutes) and the Inspector's story I think was the cause for the movie being over two hours long. I also was a bit frustrated when Méliès lamented that his automaton had, he believed, been destroyed in a museum fire. When Hugo runs to the station, I already knew what would happen. I kept thinking, 'why can't Hugo and/or Isabelle tell Papa Georges that it did survive, let me show you where it is'? I know this is what happens in a movie, but couldn't we ever get characters to make things a little less mysterious and shorten the story? I don't think it would have affected either the flow or the sentimentality of the story to have Méliès be reunited with his automaton without having poor Hugo go through so many hoops. Minus those missteps, Hugo is pure enchantment, a film that is served by being in 3-D, a movie that speaks to the importance of film preservation and the magic within film itself, to the wonders of the human imagination. Hugo would be a film that I would show my children if they were to ever understand not just the beauty of those early films from Méliès but on how the mind can create beautiful things.